The quadralectic philosophy is based on a dynamic interpretation of reality, and the width of its outlook makes it possible to delineate a whole quadrant (IV) to the process of analogy. This most basic of the Aristotelian entities was often not seen as a separate device in the great mechanisms of comparison: induction and deduction. It is, even now, closely linked to the lower type of division thinking. A comparison is often, without speaking, a matter between two things. Analogy – and the process of its application – is regularly seen as a static commodity dealing with the opposition between two entities. A comparison (analogy) in the quadralectic approach is, on the other hand, a dynamic interaction between the four quadrants simultaneously – which includes an evaluation of its own position (in the Fourth Quadrant). The (multiple) comparison is the hallmark of the Fourth Quadrant. It is, in a linear view, the apex of the communication in its stride through the quadrants. Now, towards the end of the circle, a full view is possible. Everything is at our disposal. This statement might be true, but is not appropriate in the full understanding of the (cyclic) quadralectic philosophy. The translation of our experiences as a culmination in a last segment of a communication finds its roots in oppositional division thinking. The tetradic nature, including the position of analogy as a comparison mechanism in its fourth member, was realized much earlier. A picture of cyclic equality emerged as soon as the decision to communicate in a four-fold setting was taken. There is no apex or climax, except perhaps in the limited view of the Third Quadrant. Only intensio and remissio are the leading agents throughout the cyclic movement. However, the CF-graph can be used as a means of comparison itself. This operation was already theoretically captured in the Second Quadrant, but can now be made fully operational between the third and fourth quarter of the Fourth Quadrant. It is only at this late moment that the observer has the full advantage of the empirical achievements in the Third Quadrant and transposes them in the context of a Fourth Quadrant. The CF-graph becomes the yardstick for creation. Mankind has always been fascinated by the forces, which exercise within a communication. These mutual influences can only be measured in a comparison. Crucial in such an effort is the importance of time and place. They provide the extension in which a comparison can take place. A brief excursion into the complicated philosophical world of time-place will be made in order to place a comparison (as an analogy) in its proper context. The philosophy of Time has a long history and the question ‘What is time?’ has been posed repeatedly. The Greek god Kronos stood at the beginning of time and was revived by the Romans as Saturn. His reign was associated with prosperity (Golden Age). He was also the god, who castrated his father Uranus (Ouranos, sky), because his offspring became threatening and to many for his wife Gaia (earth) (fig. 54). Fig. 54 – The unmanning of (Uranus by) Saturn. 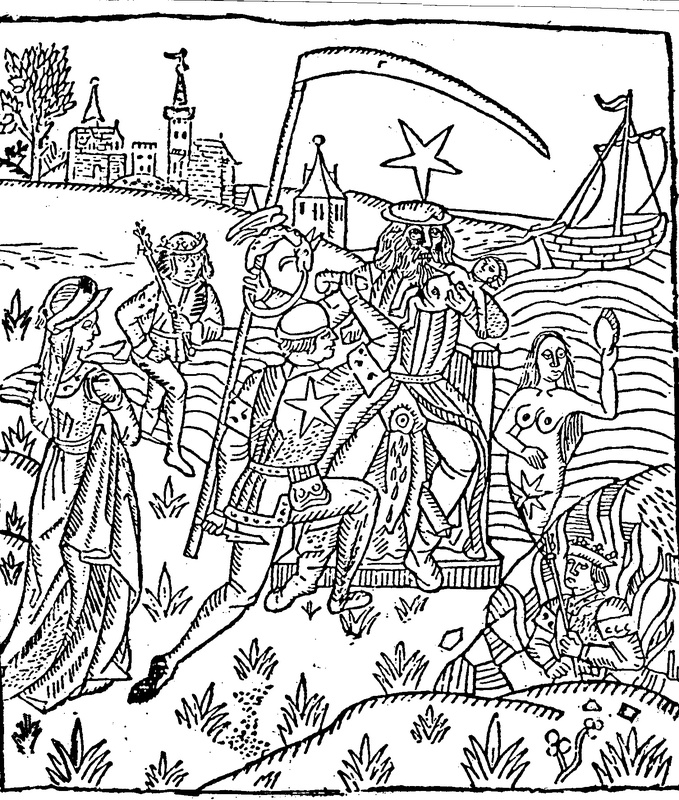 The symbolism is slightly mixed-up in this woodcut of 1484, which depicts the moment of emasculation. Kronos (Saturn), as the ruler of time carrying a scythe and an ouroboros, is here the one who is unmanned, rather than his father Uranus. The analysis of time is often, in one way or another, a concealed effort to search for the principles of division and movement. The great enigma of the spatial existence in time can only be solved – or better: described in a dynamic setting – if the lasting influence of the primordial division (in the Second Quadrant) is realized. The famous paradoxes of Zeno (from Elea, fifth-century BC) challenged the notion of time and space as infinitely divisible. Four paradoxes reached eternal notoriety: the dichotomy (or motionless runner), the Achilles, the arrow and the stadium. His apparent contradictions are practical examples of the untenable position of extreme oppositional thinking. The results of this confrontation and the changing nature of division and movement – the two fundamental building stones of a communication (see fig. 4, p. 13) – are confusing for someone, who is reluctant to leave the save environment of observational security (in the Third Quadrant). Zeno’s paradoxes are, in principle, inquiries into the ‘in between’: the areas of immeasurability (see also p. 96). We know that a certain interaction in a communication takes place, just like the observer sees Zeno’s arrow in motion, but its actual position can only be measured in a reconstruction, when (two) fixed points are known. A straightforward, dual mind can now draw the conclusion that no motion occurs when such points of reference are absent. Any definition (of time) will lead to conceptual questions ‘having to do with the nature of the concepts of truth, events, things, knowledge, causality, identification, action and change’ (GALE, 1968). This being granted, it has also to be taken down that none of these entities make any sense if they are not placed in a division environment. Any discussion of time and place – and the comparisons, which are used to measure them – is of little use if the type of division thinking is not stated. These drastic measures were taken by someone who looked steadfast ahead from the Third to the Fourth Quadrant and did not look back. Otherwise he would have seen that those ‘dispensable categories’ were nothing less than (Second Quadrant) ideas, which fill the very real position of the ‘in between’. To speak of a conflict between determinism and the indeterminate – like Williams does (in: GALE, 1968; p. 345) – is another indication of oppositional thinking. Furthermore, the ‘static versus the dynamic temporal’ (or the B- and A-Theory of Time), as pioneered by ‘one of the last British Hegelians’, J.M.E. McTaggert (1866 – 1925), followed that same route and ends up with a ‘paradox’ or a denial (McTAGGART, 1908; 1927). The incompatibility of the static and dynamic (temporal) is only the result of a particular way of looking at Time. If Time is placed in an oppositional environment (like the Third Quadrant), there is no way out. It is either…or. Impossible paradoxes lurk at the horizon, and long and fruitless attempts are made to bring things together. Aristotle had connected time with movement by stating that time is the ‘number of movement in respect of ‘before’ and ‘after’. The reference to ‘number’ seems to suggest a certain division, or at least a succession or repetition. Plotinus, living in the third century AD, pointed rightly to the circularity in Aristotle’s definition. Time cannot be a number, but what is numbered. Before and after can only exist in time, and should not have a place in the definition of time. The presence of a Number does not give Time. Plotinus therefore placed (in the Third Ennead) Time as something apart, a thing ‘within itself’. A proper comparison (or measurement) of Time-in-itself is bound to fail. Locke (1632 – 1704), who was earlier encountered in relation to language (p. 41), saw time as the space between (two) ideas: ‘The distance between the appearance of any two ideas in the mind is what we call duration.’ (Essay II, XIV). The ideas have since moved to a humbler levee and are replaced in recent epistemology by ‘sense-data’. This means effectively a move from the dynamic Second to the dynamic Fourth Quadrant, but it still does not throw more light in the nature of time. Nevertheless, the great American psychologist and philosopher William James (1842 -1910), in his book ‘Principles of Psychology’ (1890, Vol. I, p. 642), tried to be more precise. He stated: ‘We are constantly aware of a certain duration – the specious present – varying from a few seconds to probably not more than a minute, and this duration (with its content perceived as having one part earlier and another part later) is the original intuition of time’. This definition has several attractive sides to it when placed in the light of a quadralectic interpretation. The description consists of four sections: there is a distinct unit (the specious present), which has a subjective time limitation (up to one minute) and can be placed in a sequence (one after another) to provide an intuitive unity (time). The specious present is an idea (Second Quadrant), that takes measurable shape (Third Quadrant) in a sequence (Fourth Quadrant) which leads to an intuition (First Quadrant). James gave in his notion (or definition) of time a complete overview of a quadralectic cycle. Time starts – in human time – in the invisible visibility (II), becomes measurable in the visible visibility (III), is placed in the multitude of the visible invisibility (IV) and finds its ultimate being in the invisible invisibility (I). Time is in every division and type of visibility. The flow of time and the moment of time are appearances of the same phenomenon, just like there is a river and a drop of water. The conception behind these two ‘types’ is the same: the actual and the becoming are members of the same communication. The German philosopher Martin HEIDEGGER (1889 – 1976) expressed, in his book ‘Sein und Zeit’ (Being and Time; 1927/2010), this opinion. Time is, in his view, not a sequence of temporary moments (now’s), but a temporal spread or field. The future-present-and past (of human existence) are experienced as Ek-sistenz, literally the standing beyond oneself. The present quadralectic line of thinking follows space (in time and place) from its ‘absolute’ beginning (in the First Quadrant) to its ‘final’ resolution in the multiplicity (of the Fourth Quadrant) and generates in the meantime the playground for comparisons. The specific type of division thinking determines the rules of the game (on that playground). Time and place, either as Kantian transcendental objects or seen as elements of a Heideggerian ontological framework, have to obey to the same rules (of division thinking). Even the empirical and ontic things (the Third Quadrant visibilities) cannot escape that same understanding, although they seem to thrive in an oppositional environment. Martin Heidegger might have noticed the ‘Fourth Quadrant’ character of time (as a ‘field’) and being, but his stand in the matter of human identity was not neutral. The division between an authentic and inauthentic human existence fits in an oppositional vision (and might indirectly explain his temporary sympathies for the emerging Nazi regime). The authentic man is aware of the basic possibilities of life (including death) and creates a temporal order by which to regulate present and future. A quadralectic interpretation of this ‘authenticity’ suggests a First Quadrant environment, but the creation of a temporal order can only take place after a division-decision. The uncountable possibilities of infinity (presumably of the First Quadrant) are counteracted by a move to relative safety in the establishment of limitations and partiality of conditions). The responsive projection in time (Entwurf) is essential in Heidegger’s philosophy, because this projection also includes our life as a whole. The authentic and conscious being is one and the same thing, born in unity (of the First and/or Third Quadrant) and geared towards the understanding of multiplicity. The inauthentic man experiences time as a passive flow, and a formless passing-by. It can either have a frightening speed, sweeping the individual away, or it can be noticed as minutes slowly ticking away. In both cases, the person does not have a firm grip on the passage of time. The environment of multiplicity (flow) points, in a quadralectic interpretation, to the Second or Fourth Quadrant as a place of action. Heidegger judged the absence of conscious limitations as vulgar. Furthermore, the counting (or ‘killing’) of the time is, in Heidegger’s view, objectionable. These subjective judgements aim to demonstrate the ontological difference between the various natures of Time. It might well be, that Heidegger had a four-fold division setting in mind when he posed the opposition of the authentic (conscious) and the inauthentic (vulgar) man. However, it is unfortunate that he was unable to elucidate his vision in a more accessible way. William BARRETT (in: GALE, 1968) rightly indicated that the flow of time might also act as the ultimate concept of a primordial temporality. He also noticed that the emphasis shifted, in Heidegger’s later writings, from Time to Being. This gradual move resulted in notions like ‘das Anwesen des Anwesendes’, rendered as ‘the presence of that-which-is-emerging-as-present’. This typical Heidegger-expression tries to cover the essence of concepts (at simultaneous levels in time) in one word. The presence and the process (of presencing) are one and the same if the appropriate position in a communication is chosen. Barrett also points to the section in HEIDEGGER’s ‘Introduction to Metaphysics’ (1935) where he praises the early Greek philosophers for the absence of a dualism between Being and Becoming. He (Barrett) reinforced his idea that – if there is no dualism – Becoming (and the flow of time) might be equally primordial and basic as Being. This conclusion resembles an effort to place Being and Becoming in one primordial space (identified here as the First Quadrant) in order to dissolve the complicating influences of division. There is no need for that, although there is also no objection to do it. The absence of dualism (of the early Greek thinkers) does not necessarily involve a move to the Absolute, but can also be explained from a cognitive position in the (second division of the) Second Quadrant (II, 2), i.e. before the oppositional forces of the Third Quadrant become active. Being and Becoming are, in that situation, just ideas at an early stage of the fragmentation process, seen as ‘pure’ items in a realm of higher division thinking, without the direct interference of oppositional tendencies. The two most prominent human inventions to conquer place and time – in order to make a fundamental comparison possible – are the map and the clock. Both items have a long history running from the 12th century BC Egyptian map of the gold mines to aerial photography and from the ancient sundial to the atomic clock. The mappae mundi and most of the mediaeval maps have their symbolic and exegetic character in common. Most of them were made to glorify the Lord rather than being of any help by finding a route on earth. This mental setting was well understood by Hugh of Saint Victor (ca. 1097 – 1141) when he defined the symbol as ‘ a collecting of visible forms for the demonstration of invisible things’ (LADNER, 1979). The discovery of the world – from a European point of view – and the subsequent growing importance of map making gained momentum from the beginning of the fourteenth century onwards (HARLEY & WOODWARD, 1987). The so-called portolan maps (‘from port to port’) were produced by sailors of the Mediterranean and Black Sea and reached a great accuracy. ‘The portolan maps of the beginning of the 14th century are as good as those from the 16th’ (HAPGOOD, 1966/1979; this author believes that the origin of the portolanos must be found in a culture with a higher level of technology than was obtained in medieval or ancient times. His speculative thoughts, including a ‘lost continent’ (Antarctica) and a vanished worldwide civilization, have never fully convinced the scientific community). Fig. 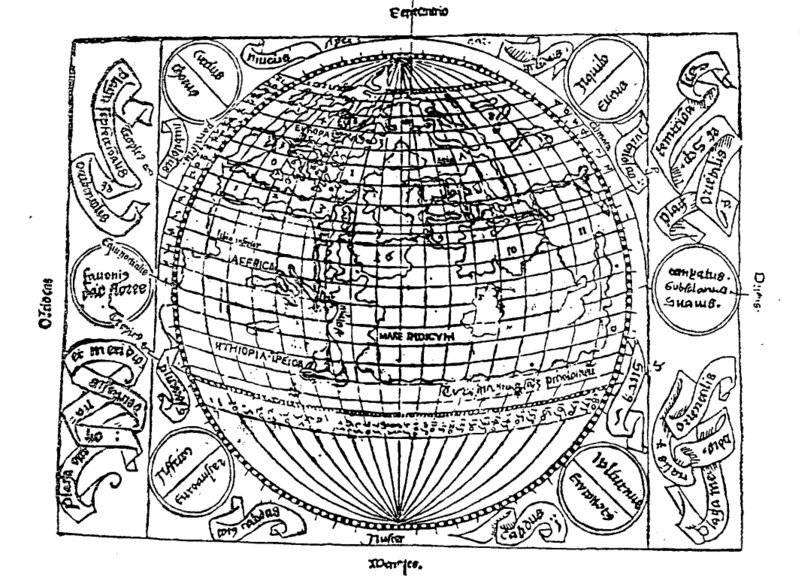 55 – This symbolic world map was given in the ‘Rudimentum novitiorium’ and printed by Lucas Brandiss in Lübeck in 1475. The art of map making kept pace with the geographic discoveries, which followed each other in rapid succession from the end of the fifteenth century onwards. The symbolic four-fold world map in the ‘Rudimentum novitiorium’ (fig. 55) was one of the last examples of a conceptual map. It was printed as a guide for young clerics and not intended for practical use. The Paradise and the four rivers are drawn at the top (east) to indicate a close relation with the heaven. Rivers run all over the world and leave most countries as islands or mountains. The ‘Pillars of Hercules’ are drawn in the very west (occidens), at the bottom of the picture. Hans Holbein the Younger produced, little more than half a century later (in 1532), a fairly comprehensive world map (the ‘Typus Cosmographia Universalis’), which showed a round earth. The Flemish-born Gerardus Mercator (1512 – 1594) was the first to use the term ‘atlas’ for a collection of maps. The map projection, which bears his name, was first deployed in 1569. His friend Abraham Ortelius (1527 – 1598), also working in Antwerp, published a year later his ‘Theatrum Orbis Terrarum’ (Theatre of the World) which is considered the first true atlas consisting of a collection of uniform map sheets. Earlier map books (after ca. 1400) were based on the work of Claudius Ptolemy, whose ‘Geographia’ was a compilation of (Greek) geographical knowledge around the second century AD. German world map of Ptolemaeus. 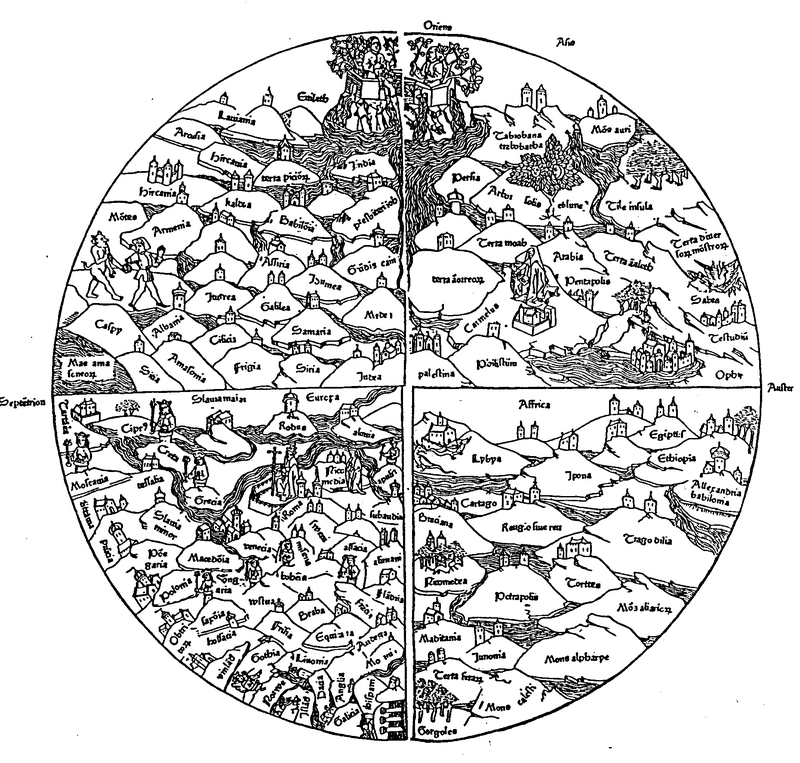 Geographia, c. 1490, Nuremberg. Unknown source. The history of clocks shows a remarkable parallel to the one of map making. Different types of clocks were known from ancient times, like the water clock and sundial, but the appearance of mechanical clocks on a large scale (in Europe) started at the beginning of the fourteenth century. Daniel J. BOORSTIN (1983) pointed to the impact that was caused by the change in the idea of duration from a gradual flow of a shadow across a dial, or water running from a bowl, to a mechanical clock with a hammer and a bell. ‘The needs of mechanical timekeeping, the logic of the machine itself, imposed a new feeling. Instead of being synonymous with the repeated cycles of the sun, which varied as the cycles of the seasons commanded, or with the shorter cycles of other flowing media, time now was to be measured by the staccato of a machine.’ (p. 38). The invention of the pendulum clock by the Dutch scientist Christiaan Huygens (1629 – 1695) around the year 1650 was the pinnacle of a Zeitgeist, which was obsessed by finding the limits of partitioning. The distinction of logarithms (by John Napier) and the creation of a logarithmic scale (by Edmund Gunter in 1620) were the visible results of that same quest, born in a spirit of oppositional thinking pushed to its limits. Now, more than three-and-a-half centuries later, the clock has reached an incredible precision by the fitting of a quartz or cesium atom to give the intermittent signal. Boorstin’s staccato has silenced. The CF-graph combines, in many respects, the intentions of cartography and the clock in one drawing: it gives a standard for a specific division of infinity. The maps and the clockworks are the products of a division of real place and time, while the CF-graph sets a standard for the virtual division of time and place. Any form of subsequent visibility, after the acceptance of the communication factor (CF) as a yardstick, is subject to the regulations of its representation. For instance, the distance on a map (as a comparison between two places) is determined by their coordinates, and the notion of time (as before and after) is measured by minutes or hours. The introduction of the ‘virtual’ CF-graph offers a medium to scale the visible and invisible entities of life and opens up a way of comparison in the boundless of place and time. The keyword is communication, which is more than just reading a map or measuring time. Communication is, in its bare essentials, the understanding of a method of valuation. A quadrigital computer would be of great help to reach that goal. This type of computer is not driven by electricity, because its expression in a language of one’s and zero’s puts it in an oppositional environment. The new machine has to be powered by a four-fold type of interaction. Present and future inventors will have to think about a tool other than the traditional dual-natured electricity as a medium to reach decisions. It has to include the outcomes of a subjective intervention and has to be found in the realm of a human-psychological transfer. In the end, we might have to look at the invention of a living (bio)computer (in a quadrigital setting) rather than a dead, mechanical one (wired on a digital circuit). Research in that vital direction started in the 1990’s and was based on the molecular nature of DNA (or deoxyribose nucleic acid), a component of the nuclear material of the cell. The knowledge of the structural setting of the DNA molecule increased rapidly. It opened up insights and possibilities for computational molecular biology. In particular, the chemical bonding and its subsequent genetic coding can be regarded as the most elementary form of (human) communication and is of the utmost importance for the present investigation. The bases guanine (G) and adenine (A) are relative large molecules in which atoms are arranged in a hexagon and a pentagon joined together. The bases thymine (T) and cytosine (C) are small molecules, consisting of atoms of carbon, nitrogen, oxygen and hydrogen, and arranged in a hexagon. The bases of nucleid acids are paired together via hydrogen bonds. 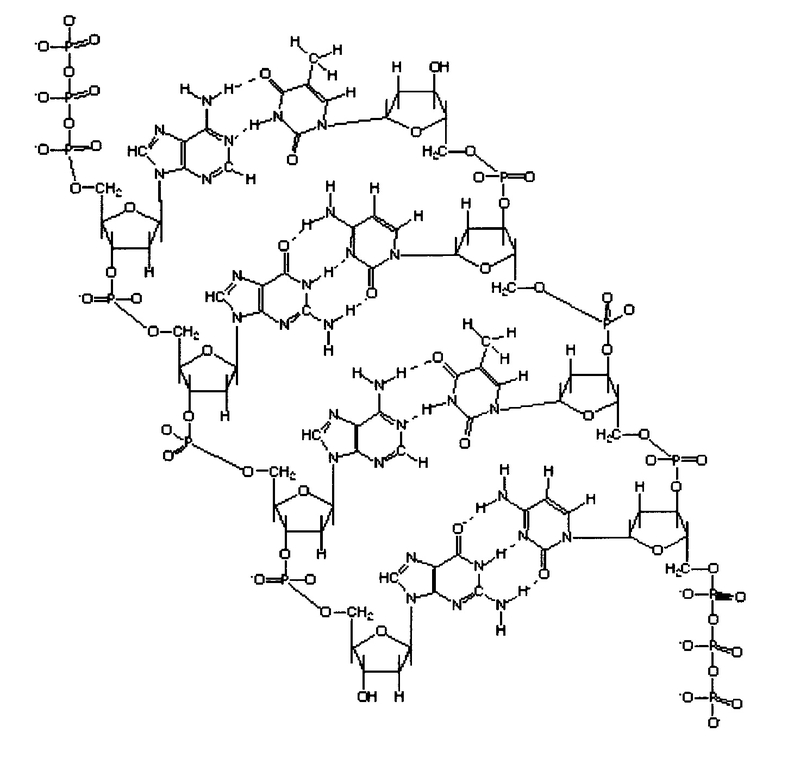 Adenine and thymine (A-T) are connected with two hydrogen bonds and guanine-cytosine (G-C) by three hydrogen bonds (fig. 56). Fig. 56 – The schematic representation of the molecular structure of DNA consists of a central component with four nitrogenous bases, arranged along a sugar-phosphate backbone in a particular order (the DNA-sequence). Griffith first discovered the process of exchange of genetic material or transformation in 1928. Crick and Wilkens, together with Watson, proposed the double-helix structure of DNA in 1953. The replication mechanism of DNA became evident in 1958: the two parental strands of DNA unwind during replication, as predicted by the model of Watson and Crick. Coding theorists tried to learn the language of the genes in order to be able to translate the message enclosed in them. The ultimate aim is to crack the genetic code, which carries the units of inheritance from parent to child. Arrays are used to analyze a sample for the presence of gene variations or mutations or for patterns of gene expression. Thousands of immobilized DNA sequences can now be presented on a miniaturized surface. Laser lithographic processes help to read the bio- (or gene) chips. A future quadrigital computer might use these sequences to find answers to quadralectic problems. It will be a giant step further – from a philosophical point of view – than the present digital computers, which are based and programmed to the positive and negative qualities of the electric current. It is important to notice the formal method, which is used in this investigation. The cogent results of gene research are obtained in a process of comparison, which is not unlike the way the CF-graph was generated. Strings of DNA are compared to each other over a given length, and the degree of analogy is measured. The difference with the ‘classical’ type of measurement must be noticed here. This latter type uses a given length (say a ruler or measuring tape) and compares a standard length with other extensions. The result is a certain figure of multiplication (of the original standard). The measurement of DNA strands deals with the degree of analogy between shared restricted fragments. The ‘standard’ is not a given entity, but is created in the process of comparison, in the same way as (two) four-fold divisions shift along each other and generate a new measuring system. The commercializing in biotechnology started in the 1980’s and the ‘Human Genome Project’ followed in 1990 in order to find all the genes on every chromosome in the body and to determine their biochemical nature. The results generate an enormous increase in knowledge at this point, but also pose new questions. If a precise location (of a certain human feature) can be found, then the subsequent doctoring of this position is the next step in line. This action might be accepted to eradicate deadly diseases, but does the bug stops there? The future of knowledge is an uncertain one.